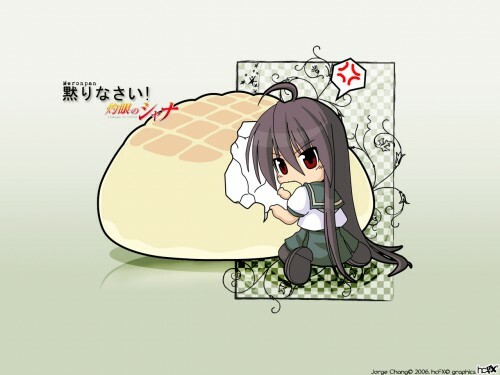 Shakugan no Shana Wallpaper: Meronpan! Minitokyo »	Shakugan no Shana Wallpapers » Shakugan no Shana Wallpaper: Meronpan! "If u dont wanna feel the Flame Haze fury, dont touch her Meronpan"
Woo, im inactive for long days, work and study are some reasons of that! Im very very busy >.<** Im becoming crazy! But when i have a little free time, i do something like this... a simply wallie hehe! Thats it, just see it and criticize it hehe! Not much to say about it but is Shana! One of my +fav series. That is so cute! Very clean lines on the character, and I like the simplicity. Would you be able to post a translation for the kanji/Japanese that isn't the title? Or is that what the quotes at the top of your post is for? XD It probably is, isn't it? At any rate, very nice wall. I like the slight shadow that is under the character and the...large bun. :-D It helps to anchor them. Hrm...maybe move the title that's in Japanese over to the left a little so it's not overlapping the bun, but that's being nit-picky. Very nice work! I especially like the green colour for the background and how it matches the bun. It's very cheery and the added decoration of the checkered pattern and vines keeps it from being too simple. Huwaaa, I like this wallie so much.Shana chan looks so cute in here, but she supposed to be happy when she eat meron pan right?